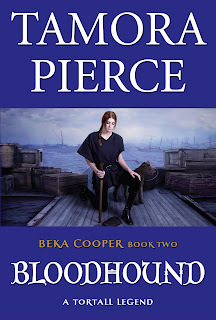 This is book two of the Legend of Beka Cooper trilogy! Click here to read my review of the first book, Terrier, and check back tomorrow for my review of the final book, Mastiff! It's been over a year since Beka Cooper and her partners Goodwin and Tunstall took down the killer that was preying on the Lower City. Now Beka is a full-fledged Dog, and finds herself unable to keep a partner that is willing to keep up and put up with her. She's assigned to Goodwin and Tunstall once again, but after a bread riot leaves Tunstall with a broken leg, Beka and Goodwin are sent to Port Caynn to try and discern the cause behind counterfeit coins that caused the riot. Their undercover operation has the potential to get deadly, especially since the Rogue of the city is a foolish woman who runs about unchecked, and the Deputy Provost is too afraid to do anything about her. When the trail runs cold, can Beka be as tenacious as a bloodhound and find the perpetrators? 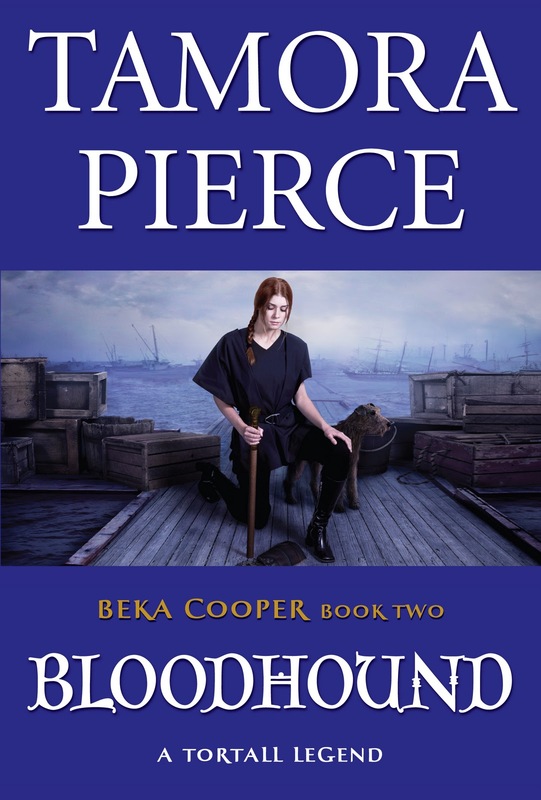 Beka is once again thrown into the midst of a dangerous, life-or-death mystery in Bloodhound. The setting of Port Caynn is different and perhaps a bit if a disappointment to those who love Corus, and the absence of some key characters is sad, but Pierce makes up for it with a few fun new characters (including a scent hound named Achoo) and an excellent mystery. Beka really becomes a strong, independent character in this novel as she must role-play with Goodwin in order to get close to their enemies, and then handle the situation on her own when Goodwin is detained in Corus. The conflict is pleasantly sophisticated and engaging—counterfeit coins are showing up, and the economy of Tortall is beginning to suffer quickly. The source of these false coins is a mystery, and as Beka and Achoo travel all over the corrupted city of Port Caynn, Pierce really expands the world of Tortall and makes it even more realistic and vivid. Beka is very grounded and persistent throughout the book, which culminates in a fast-paced, heart-pounding chase for the mastermind behind the scheme that leaves Beka close to death. The humor in this book is good, the mystery absorbing, and the action nonstop. Bloodhound is yet another excellent installment to this trilogy, though readers will be eager for the third and final book and the return of some of their favorite supporting characters. Cover Comments: I am liking the purple and how dark and mysterious this cover is! How appropriate that Beka is looking down. Very nice! Review copy received as gift. Good review! I like the way you describe the book and Beka's character.